An 11-year-old boy charged in a double shooting now faces a second murder charge. The boy was gone. Inside the farmhouse, where the Eckert family had come to start over, his parents lay bleeding. "Can we respond to Alton. . . 76 Dobbins. . . shots fired." 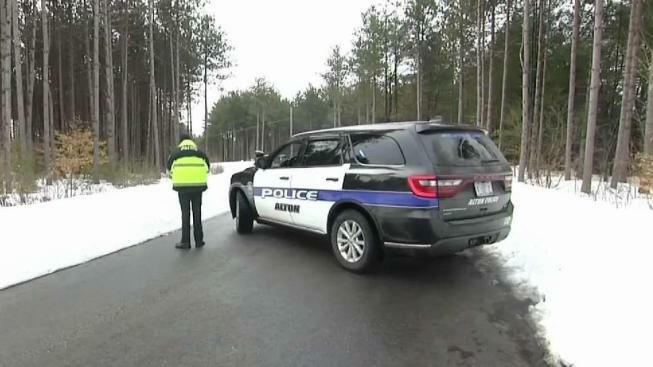 An autopsy was ordered for Jim Eckert, who was allegedly killed by an 11-year-old boy in Alton, New Hampshire. "The suspected shooter (unintelligible) is running off into the woods. He's wearing a bright, bright blue shirt with pajama pants and he is an 11-year-old." "10-5 and he's presumable to still have the weapon?" Before they retreated from the wider world into their Alton farmhouse, before they hung the "No Trespassing" signs at their property edge, the Eckerts owned a big house on a lake in Gray, Maine, and ran a successful chiropractic practice in South Portland. Far from the quiet, self-reliant existence they would embrace later, in Maine they lived large, buying timeshares, a boat, and a Mercedes camper, and working endlessly on their house. Neighbors were amazed at how fast they seemed to spend money. But James and Lizette were popular healers, and for a while, they wrote later in court documents, they could afford it. James Eckert, 48, was found suffering from gunshot wounds after police responded to a 911 call on Dobbins Way around 7:30 a.m. Friday. He was taken to Portsmouth Regional Hospital in critical condition but was pronounced dead later Friday night, the New Hampshire Attorney General's Office said. "They were straight-on chiropractic and trusted what we say is 'the power of the adjustment,'" said Kelly Worster, who met the couple in 1998 after a chiropractor in Boston sent her to see them for help with her migraines. "A lot of miracles happened in that office. As a result, they changed a lot of lives." James co-wrote a book on wellness, and taught seminars on health. Lizette's passion was taking care of families, Worster said. She performed chiropractic adjustments on babies, pregnant women, and women in labor. "She was fearless," said Worster. Later, when they lived in Alton, James and Lizette would tell friends and clients that they had left Maine because life had become too full of things and they wanted something simpler, more meaningful. They spoke glancingly of troubles, or of a "court battle," but they were private people. There was no reason to pry. The "court battle" stemmed from a 2009 IRS audit of Innate Chiropractic. The agency hit the Eckerts with an assessment of more than $100,000. The couple tried to challenge the audit but failed. They filed for bankruptcy in August 2011, hoping they could use the proceeding to fight the validity of the IRS assessment, which they considered "bureaucratic caprice," according to court documents. The same month, they dissolved their chiropractic business. In court documents, they listed their assets at a little less than $600,000, and their liabilities at more than $2 million. By March 2012, they had stopped paying the mortgage on their house, according to state court documents. Their bankruptcy was moving, against their wishes, toward liquidation. They stood to lose everything.They saw themselves as victims of a hostile judiciary, and in a June 2012 filing, accused the court of bad faith and bias. "The debtors object to producing anything further in this case based on their right to remain silent," they wrote. In July 2012, the bankruptcy was dismissed at the Eckerts' request, and they were left underwater with all their debts — and a fierce and bitter disbelief in the existence of justice in America. Years later, James would tell a good friend, Josh Youssef, that a "court battle" reshaped his perception of the world. Youssef, who owns a small computer repair business and was a Republican state Senate candidate, said he told James, "When you're in school they teach you, tell the truth, and liberty and justice will prevail, and that's a lie. "James agreed, Youssef recalled. He said he had been living that lie for years, but now he saw the truth.In the Eckerts' last few years on the lake in Maine, as their legal and financial troubles mounted, their neighbors watched with growing alarm as they became more isolated. James stopped going to work. The children roamed with what appeared to be little supervision. The youngest boy often cried. When the bank sued the Eckerts the next year, seeking nearly $500,000 in missed mortgage payments, the deputy sheriffs couldn't find them to serve them the paperwork. "The structure is vacant," one deputy scrawled on a court filing. "Snow undisturbed." The farmhouse in Alton where the Eckerts moved, built in 1770, was purchased for $140,000 in October 2012 by a man who appears to be Lizette's father, according to public records. It was a beautiful property, 19 acres, ringed by trees, and the Eckerts seemed happy there, tending the land and seeing chiropractic clients. "They wanted to be quiet and handle things," said DeLemus. "They were very self-sufficient and independent people." Youssef said he used to have long political discussions with James, who he said wanted to rely on himself because he did not trust that the systems in place would take care of him or his family. The Eckerts didn't have television, and home schooled the children. But James wasn't a zealot, Youssef said: "He thought: Live and let live." The family wasn't isolated from the community, friends said. They were a regular presence at youth soccer games, church events, and road races, and hosted an annual pig roast at the farm. Lizette had a job as a chiropractor at Sanctuary Body Works in Pittsfield. James ran his chiropractic business in Alton, calling it "The Big Idea." "Now let me tell you a little more what I believe and why I do what I do. . ." James wrote in a March 2013 article for the local paper. "Because I desire to help the newborn, the aged, and those without hope. Because I choose to care for the patient with the disease, not the disease. Because I wish to assist rather than intrude, to free rather than control. "He didn't take insurance, he wrote — which kept "the bean counters" out of his business. The family's friends described James, Lizette, and their daughter vividly. James: gregarious, optimistic, generous. He taught an informal class on the US Constitution, had a dry sense of humor and a goofy chuckle, ran ultramarathons, and swore by FiveFinger running shoes, they said. Lizette: gentle, loving, patiently teaching the boys to cook pancakes and her daughter to knit. Their daughter: whip-smart, she sold homemade soaps and jewelry and saved up enough to buy herself a horse. DeLemus treasures a beautiful pair of boiled wool mittens in robin's egg blue the girl knit for her. But in these stories, the boys are indistinct. Many people believed they were twins, though they were born two years apart. When they attended DeLemus's Bible study several years ago, they would color in the kitchen while their older sister sat with their parents. They were shy — but of course, DeLemus said, they were children. James's chiropractic patients remember seeing them when they arrived at the farm for treatment, but they didn't interact. But, then, why would they? On Facebook, Lizette "liked" a TV show called "Disconnected Kids, Reconnected Families" and a page for "Beyond Trauma and Attachment," a group that supports parents raising children who have suffered complex trauma and have attachment difficulties. But there are few other clues about their life at home with the boys. The woman who runs the trauma and attachment group said she never spoke to Lizette. Neither James nor Lizette gave any hint of any trouble with either of the boys, friends said. When DeLemus tries to puzzle it out now, she wonders if her friends' youngest son was having problems but they kept quiet to protect him. But she admits she doesn't know. "It's what you project onto a blank screen," she said. Police have declined to talk about the case, citing the age of the boy they have arrested and charged with second-degree murder. They have not confirmed that he is James and Lizette's son, though two people with knowledge of the investigation told the Globe that he is. Authorities have not detailed a motive, or answered questions about how the children were treated, or how an 11-year-old boy had access to a gun. 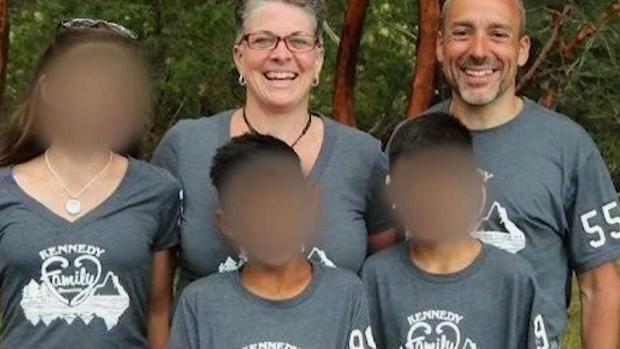 In an undated family photo posted on Facebook, James and Lizette stand behind their three children, all wearing matching shirts with the word "Family" in a heart. The boys stand in front, smiling. They look happy. When police arrived at the farmhouse on March 15, Lizette was already dead, a single bullet in her head. James was still breathing, but barely. The boy was headed toward the neighboring town of New Durham, they thought. Maybe a friend's house on Berry Road. "If we could push a few more units up to the house so we can lock down an inner perimeter and get EMS in here, one of the victims is still alive currently," came the police transmission just before 8 a.m.
"OK 10-5 I'm uh, I'm en route to the house." Officers requested backup and dogs and a patrol of the perimeters they'd set up. They checked the friend's house, but the boy was not there. "Keep your eye when you're on that post," came the radio chatter. "He's in the woods. Unaccounted for." They took the Eckerts' remaining children, the girl and the older boy, to the fire department. They locked down the schools. They looked for footprints in the snow. Police set up a command post about a mile from 76 Dobbins Way, in a 97-year-old woman's dining room under an amber glass lamp. She read an Erma Bombeck book while they worked. Outside, fog was rolling in. 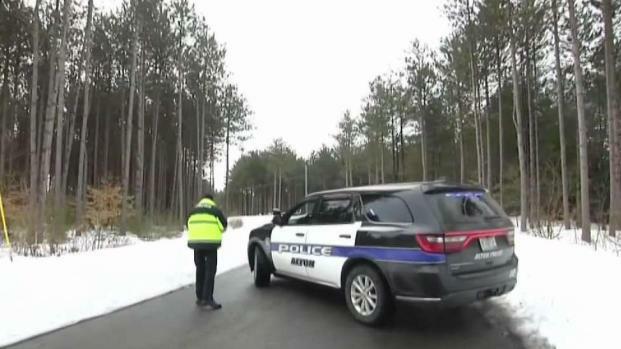 "To the units in Alton, Berry, and Valley Road area, the Belknap County special ops team has seven, eight people going into the woods following tracks from the house towards the Berry and Valley Road Area," the radio announced. "All units be advised." And then, a half hour later, and nearly two hours after the shots were fired: "The child's in custody." The family's farm is quiet now. Signs still warn intruders away, still guarding the family's secrets. The snow clings to brown earth, black birds rise and disappear into the naked trees.